The beta-2 adrenergic receptor (β2 adrenoreceptor), also known as ADRB2, is a cell membrane-spanning beta-adrenergic receptor that interacts with (binds) epinephrine, a hormone and neurotransmitter (ligand synonym, adrenaline) whose signaling, via adenylate cyclase stimulation through trimeric Gs proteins, increased cAMP, and downstream L-type calcium channel interaction, mediates physiologic responses such as smooth muscle relaxation and bronchodilation. The official symbol for the human gene encoding the β2 adrenoreceptor is ADRB2. The ADRB2 gene is intronless. Different polymorphic forms, point mutations, and/or downregulation of this gene are associated with nocturnal asthma, obesity and type 2 diabetes. The 3D crystallographic structure (see figure and links to the right) of the β2-adrenergic receptor has been determined by making a fusion protein with lysozyme to increase the hydrophilic surface area of the protein for crystal contacts. An alternative method, involving production of a fusion protein with an agonist, supported lipid-bilayer co-crystallization and generation of a 3.5 Å resolution structure. This receptor is directly associated with one of its ultimate effectors, the class C L-type calcium channel CaV1.2. This receptor-channel complex is coupled to the Gs G protein, which activates adenylyl cyclase, catalysing the formation of cyclic adenosine monophosphate (cAMP) which then activates protein kinase A, and counterbalancing phosphatase PP2A. Protein kinase A then goes on to phosphorylate (and thus inactivate) myosin light-chain kinase, which causes smooth muscle relaxation, accounting for the vasodilatory effects of beta 2 stimulation. The assembly of the signaling complex provides a mechanism that ensures specific and rapid signaling. 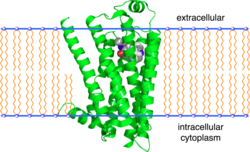 A two-state biophysical and molecular model has been proposed to account for the pH and REDOX sensitivity of this and other GPCRs. Beta-2 adrenergic receptors have also been found to couple with Gi, possibly providing a mechanism by which response to ligand is highly localized within cells. In contrast, Beta-1 adrenergic receptors are coupled only to Gs, and stimulation of these results in a more diffuse cellular response. This appears to be mediated by cAMP induced PKA phosphorylation of the receptor. Bronchi Facilitation of respiration. Hence, beta-2 agonists can be useful in treating asthma. Tremor Motor nerve terminals. Tremor is mediated by PKA mediated facilitation of presynaptic Ca2+ influx leading to acetylcholine release. The function facilitates the fight-or-flight response. Increases heart rate  in sinoatrial node (SA node) (chronotropic effect). Increases atrial cardiac muscle contractility. (inotropic effect). Increases contractility and automaticity of ventricular cardiac muscle. Dilate arterioles to skeletal muscle. Subsequent increased pressure-dependent uveoscleral outflow of humour, despite reduced drainage of humour via the Canal of Schlemm. In glaucoma, drainage is reduced (open-angle glaucoma) or blocked completely (closed-angle glaucoma). In such cases, beta-2 stimulation with its consequent increase in humour production is highly contra-indicated, and conversely, a topical beta-2 antagonist such as timolol may be employed. Glycogenolysis and gluconeogenesis in liver. Glycogenolysis and lactate release in skeletal muscle. Contract sphincters of Gastrointestinal tract. Inhibit histamine-release from mast cells. Increase protein content of secretions from lacrimal glands. Receptor also present in cerebellum. * denotes selective antagonist to the receptor. ^ Johnson M (January 2006). “Molecular mechanisms of beta(2)-adrenergic receptor function, response, and regulation”. The Journal of Allergy and Clinical Immunology. 117 (1): 18–24, quiz 25. doi:10.1016/j.jaci.2005.11.012. PMID 16387578. ^ “Entrez Gene: ADRB2 adrenoceptor beta 2, surface”. Retrieved 8 February 2015. ^ “Entrez Gene: ADRB2 adrenergic, beta-2-, receptor, surface”. ^ Cherezov V, Rosenbaum DM, Hanson MA, Rasmussen SG, Thian FS, Kobilka TS, Choi HJ, Kuhn P, Weis WI, Kobilka BK, Stevens RC (2007). “High-resolution crystal structure of an engineered human β2-adrenergic G protein-coupled receptor”. Science. 318 (5854): 1258–65. Bibcode:2007Sci…318.1258C. doi:10.1126/science.1150577. PMC 2583103. PMID 17962520. ^ Rosenbaum DM, Cherezov V, Hanson MA, Rasmussen SG, Thian FS, Kobilka TS, Choi HJ, Yao XJ, Weis WI, Stevens RC, Kobilka BK (2007). “GPCR engineering yields high-resolution structural insights into β2-adrenergic receptor function”. Science. 318 (5854): 1266–73. Bibcode:2007Sci…318.1266R. doi:10.1126/science.1150609. PMID 17962519. ^ Rasmussen SG, Choi HJ, Rosenbaum DM, Kobilka TS, Thian FS, Edwards PC, Burghammer M, Ratnala VR, Sanishvili R, Fischetti RF, Schertler GF, Weis WI, Kobilka BK (Nov 2007). “Crystal structure of the human beta2 adrenergic G-protein-coupled receptor”. Nature. 450 (7168): 383–7. Bibcode:2007Natur.450..383R. doi:10.1038/nature06325. PMID 17952055. ^ Rubenstein LA, Zauhar RJ, Lanzara RG (Dec 2006). “Molecular dynamics of a biophysical model for beta2-adrenergic and G protein-coupled receptor activation”. Journal of Molecular Graphics & Modelling. 25 (4): 396–409. doi:10.1016/j.jmgm.2006.02.008. PMID 16574446. ^ Chen-Izu Y, Xiao RP, Izu LT, Cheng H, Kuschel M, Spurgeon H, Lakatta EG (Nov 2000). “G(i)-dependent localization of beta(2)-adrenergic receptor signaling to L-type Ca(2+) channels”. Biophysical Journal. 79 (5): 2547–56. Bibcode:2000BpJ….79.2547C. doi:10.1016/S0006-3495(00)76495-2. PMC 1301137. PMID 11053129. ^ Zamah AM, Delahunty M, Luttrell LM, Lefkowitz RJ (Aug 2002). “Protein kinase A-mediated phosphorylation of the beta 2-adrenergic receptor regulates its coupling to Gs and Gi. Demonstration in a reconstituted system”. The Journal of Biological Chemistry. 277 (34): 31249–56. doi:10.1074/jbc.M202753200. PMID 12063255. ^ a b c d e f Fitzpatrick D, Purves D, Augustine G (2004). “Table 20:2”. Neuroscience (Third ed.). Sunderland, Mass: Sinauer. ISBN 978-0-87893-725-7. ^ von Heyden B, Riemer RK, Nunes L, Brock GB, Lue TF, Tanagho EA (1995). “Response of guinea pig smooth and striated urethral sphincter to cromakalim, prazosin, nifedipine, nitroprusside, and electrical stimulation”. Neurourology and Urodynamics. 14 (2): 153–68. doi:10.1002/nau.1930140208. PMID 7540086. ^ Moro C, Tajouri L, Chess-Williams R (January 2013). “Adrenoceptor function and expression in bladder urothelium and lamina propria”. Urology. 81 (1): 211.e1–7. doi:10.1016/j.urology.2012.09.011. PMID 23200975. ^ Rang HP (2003). Pharmacology. Edinburgh: Churchill Livingstone. p. 270. ISBN 978-0-443-07145-4. ^ Philipson, L. H. (December 2002). “beta-Agonists and metabolism”. The Journal of Allergy and Clinical Immunology. 110 (6 Suppl): S313–317. doi:10.1067/mai.2002.129702. ISSN 0091-6749. PMID 12464941. ^ Elenkov IJ, Wilder RL, Chrousos GP, Vizi ES (Dec 2000). “The sympathetic nerve–an integrative interface between two supersystems: the brain and the immune system”. Pharmacological Reviews. 52 (4): 595–638. PMID 11121511. ^ Matera MG, Cazzola M (2007). “ultra-long-acting beta2-adrenoceptor agonists: an emerging therapeutic option for asthma and COPD?”. Drugs. 67 (4): 503–15. doi:10.2165/00003495-200767040-00002. PMID 17352511. ^ Fan G, Shumay E, Wang H, Malbon CC (Jun 2001). “The scaffold protein gravin (cAMP-dependent protein kinase-anchoring protein 250) binds the beta 2-adrenergic receptor via the receptor cytoplasmic Arg-329 to Leu-413 domain and provides a mobile scaffold during desensitization”. The Journal of Biological Chemistry. 276 (26): 24005–14. doi:10.1074/jbc.M011199200. PMID 11309381. ^ Shih M, Lin F, Scott JD, Wang HY, Malbon CC (Jan 1999). “Dynamic complexes of beta2-adrenergic receptors with protein kinases and phosphatases and the role of gravin”. The Journal of Biological Chemistry. 274 (3): 1588–95. doi:10.1074/jbc.274.3.1588. PMID 9880537. ^ McVey M, Ramsay D, Kellett E, Rees S, Wilson S, Pope AJ, Milligan G (Apr 2001). “Monitoring receptor oligomerization using time-resolved fluorescence resonance energy transfer and bioluminescence resonance energy transfer. The human delta -opioid receptor displays constitutive oligomerization at the cell surface, which is not regulated by receptor occupancy”. The Journal of Biological Chemistry. 276 (17): 14092–9. doi:10.1074/jbc.M008902200. PMID 11278447. ^ Karoor V, Wang L, Wang HY, Malbon CC (Dec 1998). “Insulin stimulates sequestration of beta-adrenergic receptors and enhanced association of beta-adrenergic receptors with Grb2 via tyrosine 350”. The Journal of Biological Chemistry. 273 (49): 33035–41. doi:10.1074/jbc.273.49.33035. PMID 9830057. ^ Temkin P, Lauffer B, Jäger S, Cimermancic P, Krogan NJ, von Zastrow M (Jun 2011). “SNX27 mediates retromer tubule entry and endosome-to-plasma membrane trafficking of signalling receptors”. Nature Cell Biology. 13 (6): 715–21. doi:10.1038/ncb2252. PMC 3113693. PMID 21602791. ^ Karthikeyan S, Leung T, Ladias JA (May 2002). “Structural determinants of the Na+/H+ exchanger regulatory factor interaction with the beta 2 adrenergic and platelet-derived growth factor receptors”. The Journal of Biological Chemistry. 277 (21): 18973–8. doi:10.1074/jbc.M201507200. PMID 11882663. ^ Hall RA, Ostedgaard LS, Premont RT, Blitzer JT, Rahman N, Welsh MJ, Lefkowitz RJ (Jul 1998). “A C-terminal motif found in the beta2-adrenergic receptor, P2Y1 receptor and cystic fibrosis transmembrane conductance regulator determines binding to the Na+/H+ exchanger regulatory factor family of PDZ proteins”. Proceedings of the National Academy of Sciences of the United States of America. 95 (15): 8496–501. Bibcode:1998PNAS…95.8496H. doi:10.1073/pnas.95.15.8496. PMC 21104. PMID 9671706. ^ Hall RA, Premont RT, Chow CW, Blitzer JT, Pitcher JA, Claing A, Stoffel RH, Barak LS, Shenolikar S, Weinman EJ, Grinstein S, Lefkowitz RJ (Apr 1998). “The beta2-adrenergic receptor interacts with the Na+/H+-exchanger regulatory factor to control Na+/H+ exchange”. Nature. 392 (6676): 626–30. Bibcode:1998Natur.392..626H. doi:10.1038/33458. PMID 9560162. Frielle T, Caron MG, Lefkowitz RJ (May 1989). “Properties of the beta 1- and beta 2-adrenergic receptor subtypes revealed by molecular cloning”. Clinical Chemistry. 35 (5): 721–5. PMID 2541947. Taylor DR, Kennedy MA (2002). “Genetic variation of the beta(2)-adrenoceptor: its functional and clinical importance in bronchial asthma”. American Journal of Pharmacogenomics. 1 (3): 165–74. doi:10.2165/00129785-200101030-00002. PMID 12083965. Thibonnier M, Coles P, Thibonnier A, Shoham M (2002). Molecular pharmacology and modeling of vasopressin receptors. Progress in Brain Research. 139. pp. 179–96. doi:10.1016/S0079-6123(02)39016-2. ISBN 9780444509826. PMID 12436935. Ge D, Huang J, He J, Li B, Duan X, Chen R, Gu D (Jan 2005). “beta2-Adrenergic receptor gene variations associated with stage-2 hypertension in northern Han Chinese”. Annals of Human Genetics. 69 (Pt 1): 36–44. doi:10.1046/j.1529-8817.2003.00093.x. PMID 15638826. Muszkat M (Aug 2007). “Interethnic differences in drug response: the contribution of genetic variability in beta adrenergic receptor and cytochrome P4502C9”. Clinical Pharmacology and Therapeutics. 82 (2): 215–8. doi:10.1038/sj.clpt.6100142. PMID 17329986.
von Zastrow M, Kobilka BK (Feb 1992). “Ligand-regulated internalization and recycling of human beta 2-adrenergic receptors between the plasma membrane and endosomes containing transferrin receptors”. The Journal of Biological Chemistry. 267 (5): 3530–8. PMID 1371121. Gope R, Gope ML, Thorson A, Christensen M, Smyrk T, Chun M, Alvarez L, Wildrick DM, Boman BM (1992). “Genetic changes at the beta-2-adrenergic receptor locus on chromosome 5 in human colorectal carcinomas”. Anticancer Research. 11 (6): 2047–50. PMID 1663718. Bouvier M, Guilbault N, Bonin H (Feb 1991). “Phorbol-ester-induced phosphorylation of the beta 2-adrenergic receptor decreases its coupling to Gs”. FEBS Letters. 279 (2): 243–8. doi:10.1016/0014-5793(91)80159-Z. PMID 1848190. Yang-Feng TL, Xue FY, Zhong WW, Cotecchia S, Frielle T, Caron MG, Lefkowitz RJ, Francke U (Feb 1990). “Chromosomal organization of adrenergic receptor genes”. Proceedings of the National Academy of Sciences of the United States of America. 87 (4): 1516–20. Bibcode:1990PNAS…87.1516Y. doi:10.1073/pnas.87.4.1516. PMC 53506. PMID 2154750. Hui KK, Yu JL (May 1989). “Effects of protein kinase inhibitor, 1-(5-isoquinolinylsulfonyl)-2-methylpiperazine, on beta-2 adrenergic receptor activation and desensitization in intact human lymphocytes”. The Journal of Pharmacology and Experimental Therapeutics. 249 (2): 492–8. PMID 2470898. Hen R, Axel R, Obici S (Jun 1989). “Activation of the beta 2-adrenergic receptor promotes growth and differentiation in thyroid cells”. Proceedings of the National Academy of Sciences of the United States of America. 86 (12): 4785–8. Bibcode:1989PNAS…86.4785H. doi:10.1073/pnas.86.12.4785. PMC 287358. PMID 2471981. O’Dowd BF, Hnatowich M, Caron MG, Lefkowitz RJ, Bouvier M (May 1989). “Palmitoylation of the human beta 2-adrenergic receptor. Mutation of Cys341 in the carboxyl tail leads to an uncoupled nonpalmitoylated form of the receptor”. The Journal of Biological Chemistry. 264 (13): 7564–9. PMID 2540197. Bristow MR, Hershberger RE, Port JD, Minobe W, Rasmussen R (Mar 1989). “Beta 1- and beta 2-adrenergic receptor-mediated adenylate cyclase stimulation in nonfailing and failing human ventricular myocardium”. Molecular Pharmacology. 35 (3): 295–303. PMID 2564629. Emorine LJ, Marullo S, Delavier-Klutchko C, Kaveri SV, Durieu-Trautmann O, Strosberg AD (Oct 1987). “Structure of the gene for human beta 2-adrenergic receptor: expression and promoter characterization”. Proceedings of the National Academy of Sciences of the United States of America. 84 (20): 6995–9. Bibcode:1987PNAS…84.6995E. doi:10.1073/pnas.84.20.6995. PMC 299215. PMID 2823249. Chung FZ, Wang CD, Potter PC, Venter JC, Fraser CM (Mar 1988). “Site-directed mutagenesis and continuous expression of human beta-adrenergic receptors. Identification of a conserved aspartate residue involved in agonist binding and receptor activation”. The Journal of Biological Chemistry. 263 (9): 4052–5. PMID 2831218. Yang SD, Fong YL, Benovic JL, Sibley DR, Caron MG, Lefkowitz RJ (Jun 1988). “Dephosphorylation of the beta 2-adrenergic receptor and rhodopsin by latent phosphatase 2”. The Journal of Biological Chemistry. 263 (18): 8856–8. PMID 2837466. Kobilka BK, Dixon RA, Frielle T, Dohlman HG, Bolanowski MA, Sigal IS, Yang-Feng TL, Francke U, Caron MG, Lefkowitz RJ (Jan 1987). “cDNA for the human beta 2-adrenergic receptor: a protein with multiple membrane-spanning domains and encoded by a gene whose chromosomal location is shared with that of the receptor for platelet-derived growth factor”. Proceedings of the National Academy of Sciences of the United States of America. 84 (1): 46–50. Bibcode:1987PNAS…84…46K. doi:10.1073/pnas.84.1.46. PMC 304138. PMID 3025863. Chung FZ, Lentes KU, Gocayne J, Fitzgerald M, Robinson D, Kerlavage AR, Fraser CM, Venter JC (Jan 1987). “Cloning and sequence analysis of the human brain beta-adrenergic receptor. Evolutionary relationship to rodent and avian beta-receptors and porcine muscarinic receptors”. FEBS Letters. 211 (2): 200–6. doi:10.1016/0014-5793(87)81436-9. PMID 3026848. “β2-adrenoceptor”. IUPHAR Database of Receptors and Ion Channels. International Union of Basic and Clinical Pharmacology. 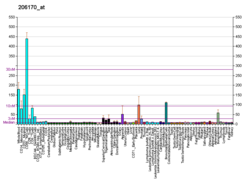 Human ADRB2 genome location and ADRB2 gene details page in the UCSC Genome Browser.